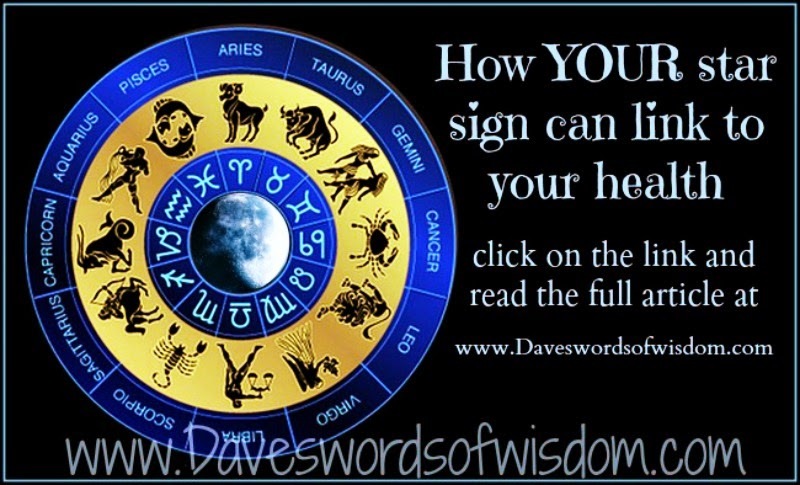 Daveswordsofwisdom.com: Is your Star Sign linked to your Health? Uranus is in charge of circulation and nerve impulses among members of this sign. If notoriously frenzied Aquarius don’t take time to breathe and relax, astrologists believe their fast pace could lead to arthritis, heart problems, swollen limbs, varicose veins, asthma, and increased allergic reactions. These ultra sensitive people are ruled by their daydreams and by Neptune, which controls the lymphatic system and feet. They run the risk of disappointment because they’re so idealistic. If that disappointment becomes overwhelming, it could cause foot problems (corns, bunions, etc.) and a weakened immune system that leaves them vulnerable to a number of diseases. Rams are analytical and thoughtful by nature, so it makes sense that their ruling planet, Mars, is involved with the head. They tend to over think things to the point of headaches, tooth issues, jaw grinding, and even facial blemishes. Venus governs over Taurus and controls the lower jaw, the throat, and insulin production. That leaves bulls prone to throat infections, thyroid conditions, stiff necks, tonsillitis, and ear infections when they’re especially worried or acting stubborn. The twins are ruled by Mercury, which deals with dual body parts (arms, legs, and so on) and the respiratory system. That leaves those of us under this sign with chronic coughs and colds, bronchitis, sore shoulders, and tendonitis—probably as a result of constantly socializing and being on the go. Crabs are tied to the stomach and digestive system, which is why they’re highly intuitive and emotionally charged. When they bury their feelings and don’t let go of anger or pain, the moon’s influence can lead to indigestion, intestinal maladies, and acid-reflux disease. The Sun watches over Leos and affects their hearts, circulation, and spine. They’re naturally authoritative and confident, so if anything’s causing them to feel otherwise, it can invite back problems, heart ailments, and lethargy. Virgos are ruled by Mercury as well, but the health focus for this sign is on the digestive tract and intestines. Virgos tend to rush through things and have too much of a one-track mind. Without enough relaxation time to balance their worker-bee tendencies, ulcers, constipation, and food allergies could result. Venus has jurisdiction over Libra and controls kidney and bladder functions. Libras thrive on pleasure (both giving and receiving), but too much of one over the other can cause excretory problems. If naturally intense Scorpios get too jealous or obsessive, or if negativity motivates their actions, Pluto can wreak havoc on their reproductive systems, as well as on their kidneys and bladders. Potential issues include painful and/or irregular menstruation, bladder infections, and diabetes. It’s all about the thighs, hips, liver, and sciatic nerve for Sagittarius, thanks to Jupiter’s dominance. Health problems range from spinal disorders and rheumatism to detoxification issues. If you have found this article to be useful, or you know someone who may enjoy this, then pass it on.